In any non-athletic endeavor, the longer you work at a job the more knowledge you gather, the more skilled you become at your profession, and the more respect you command from your peers. When athletes capture their sport’s greatest events and earn numerous championship honors and accolades, it stamps their place in the history books and puts them in constant demand throughout their career. This is the only sport where many one-time revered figures, even those voted into the Hall of Fame, are discarded and virtually forgotten, often while still in the prime of their careers. In Thoroughbred racing now, there are five active trainers who are in the Hall of Fame, as well as the only living trainer to have won the Triple Crown, yet four of the six are eking out a living, training small stables with not a single big-time owner giving them horses, while the other two maintain relatively large stables, but rarely get any fashionable, well-bred horses or ready-made horses. Any time a top owner has a horse he wants to turn over to a new trainer, whether an accomplished horse or a well-bred juvenile, you can bet that horse will be given to a Todd Pletcher or a Steve Asmussen or a Bob Baffert. When was the last time you heard of a good horse being turned over to Leroy Jolley or Frank Martin, or Jack Van Berg or Allen Jerkens or Ron McAnally or Billy Turner. These are the legends of our sport, who between them have saddled Kentucky Derby, Preakness, and Belmont winners, Breeders’ Cup winners, Eclipse Award winners, including Horses of the Year, have set single-season and career records, have led the nation in earnings, and basically ruled the sport at one time. Despite all their accomplishments and the incredible heights they have attained, they have been discarded like old worn out luggage, left to end their training days toiling in relative obscurity. As mentioned earlier, Allen Jerkens still keeps a large stable at Belmont Park, but enjoys only an occasional graded stakes victory, training mainly blue-collar horses with unfashionable pedigrees. McAnally, who is best known as the trainer of the great John Henry, along with numerous other major stakes winners, also has only an occasional minor stakes winner. This is a trainer who has saddled five national champions and won three Eclipse Awards. Jolley, who was one of the top two or three trainers in America and a major force in the classics almost every year from the mid 1970s to mid 1980s, has not run a horse in the Kentucky Derby and Preakness in 17 years, has not run a horse in the Belmont Stakes in 20 years, and has not run a horse in the Breeders’ Cup in 18 years. Frank Martin, who has led the nation in earnings, training privately for Sigmund Sommer, for whom he sent out horses like Sham and Eclipse champion Autobiography among many others, has not had a horse in the Kentucky Derby and Preakness in 35 years, has not had a horse in the Belmont in 25 years, and has not saddled a horse in the Breeders’ Cup since winning with his first and only starter, Outstandingly, in the inaugural Juvenile Fillies 25 years ago. Who can forget 1987 and ‘88, when Jack Van Berg, the perennial leader in number of wins, finally reached the pinnacle of his career, winning the Kentucky Derby, Preakness, and Breeders’ Cup Classic and numerous other grade I stakes with Horse of the Year Alysheba. This came on the heels of his success with Preakness winner Gate Dancer. But Van Berg has gone 15 years without having a horse in the Kentucky Derby and Preakness, 22 years without having a horse in the Belmont, and 16 years without having a horse in the Breeders’ Cup. Imagine having the only living Triple Crown-winning trainer in Billy Turner, and no one is willing to give him good horses. His masterful job getting the speed-crazy Seattle Slew to win the Derby, Preakness, and Belmont has all but been forgotten by today’s owners who are desperately looking for that elusive classic horse. Why then hasn’t Turner been back to the Kentucky Derby in 32 years, and the Preakness and Belmont in 25 years? Why has he never saddled a horse in the Breeders’ Cup? Finally, there is The Chief, Allen Jerkens, arguably the most respected and revered trainer in the country. There he is at Belmont Park, still training his string of horses, resigned to the fact his chances of winning a classic or a Breeders’ Cup race have all but passed him by. Jerkens’ last trip to the Kentucky Derby, one of only three, was 17 years ago. Amazingly, he’s never run a horse in the Preakness, and hasn’t saddled a horse in the Belmont at his home track in 10 years. His trips to the Breeders’ Cup have been sporadic, although he did saddle Society Selection to a second-place finish in the 2005 Distaff. So, what happened? Did these one-time titans of the turf forget how to train horses? Are today’s owners so intent on sending all their horses to the mega stables with hundreds of horses that they have lost focus on the legends that are still out there after all these years, doing what they love doing, despite being shoved aside? None of them have given up. They love horses too much and love training them too much. Martin just celebrated his 84th birthday, but still gets up at 3:30 every morning. 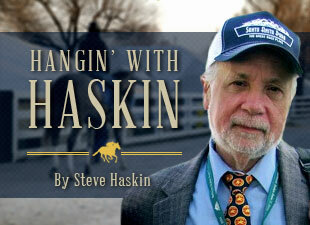 Jerkens is 80 and is still a familiar sight atop his pony each morning. Their other common bond is that, unlike other big-name trainers, they have never learned how to sell themselves. They only know how to train horses. That obviously is not enough anymore.